If there is one thing that Washingtonians are known for, it’s their love of trees. After all, Washington is called the Evergreen State for a reason. There is a lot of effort that goes into properly caring for trees, though, and not everyone can put that time in. On top of that, not everyone knows what their trees need. Every tree is different, and there’s nothing wrong with getting lost in the weeds. If you find yourself swamped in your day-to-day life, at Mr. Tree, we’re more than happy to pitch in and give your trees the care they deserve. We’re proud to provide tree care in the heart of the Pacific Northwest. Whether you’re behind in your regular maintenance or you just don’t know what your trees need, we’re prepared to handle anything. Here are just a few options for tree care in Vancouver, WA. A tree should be a beautiful addition to your property, offering shade and framing your home in a charming way. Without proper maintenance, though, a tree can stop adding to the aesthetic appeal of a house and start taking away from it. If you find yourself in this position, it might be time for a little tree shaping. Tree shaping is a simple process that selectively trims and prunes your trees, making them a more cohesive part of your property. It allows you to bring the greenery on a tree into a more purposeful, attractive shape that helps highlight the structure and layout of your home. Through the process of training, you can even encourage tree trunks and branches to grow in certain directions, letting you control how they spread out in the future. Tree training is an easy way to put in a little effort now and be rewarded with a well-framed house down the road. When you’re caring for trees in Vancouver, WA, you want to be sure your trees are as gorgeous as the nature that surrounds you. Tree shaping is an easy way to achieve that. Pruning might seem like shaping on the surface, but the intention behind it is quite different. Where tree shaping aims to help create a specific look or image, pruning is crucial to the long-term health of your trees. Pruning makes up a large portion of the tree care we provide in Vancouver, WA, because nearly every tree owner needs it at one point or another. If a tree is growing out of control into a walkway, pruning can help bring things back into order. If it’s becoming top heavy or weighed down on one side, selective pruning can balance things out and prevent any breakage. Even if part of the tree is dying or rotting, careful pruning can save the rest of the tree. It may not be anything dramatic, but pruning helps keep your trees happy and healthy. If you’ve lived in cities or sizable towns most of your life, it’s easy to forget that the nature we see can easily grow wild. Just like a yard or garden that’s left unattended, your trees can quickly become unruly if left to their own devices. Many homeowners will try to reign in their unruly trees on their own, but tree trimming is a skill that demands experience and artistry. When things start growing out of control and you end up with a stray branch blocking the view out of your living room, it’s time to call a professional for some tree trimming. As dedicated tree care providers in Vancouver, WA, we’re ready to help bring those wild trees back under control. When our expert arborists are done, your trees will be working with your property instead of against it. It’s easy to forget that your trees aren’t just gorgeous property features; they’re living things. Like all living things, trees have their own life cycle. Sometimes no matter how much work you put into a tree, it’s reached its end. When that day comes, it’s sadly time for the tree to go. If you’re unsure if it’s time to have a tree removed, there are a few things to look for. Any dead wood or rot is an obvious sign that it’s time for a tree to come down. Cracks and seams in the tree can point to a structural weakness that can be a huge problem if any big storms roll through your neighborhood. Rot and weakness aren’t just unappealing to look at; it can be seriously dangerous. With all our experience with tree care in Vancouver, WA, we’re very familiar with the big and wonderful trees the area is famous for. Those trees become a lot less wonderful when they come crashing into a house. If a tree becomes a problem, it’s imperative that you have it removed as soon as you can. 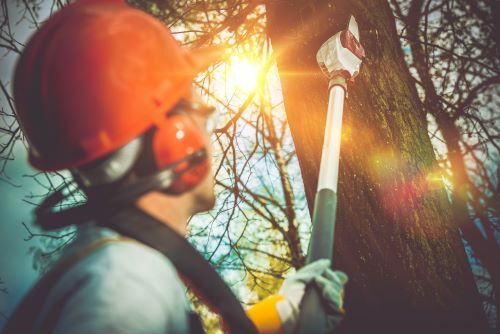 It’s much better for a trained professional to take a tree down in a controlled manner than to let nature deal with the problem, so don’t hesitate to reach out if you think it’s time. If you ever end up having to remove a tree, you may think the hard work will be over once it’s been taken down. In reality, cutting down a tree is only part of the process. Once the tree is down, you’ll still need to deal with the stump. No one wants an old stump breaking up their beautiful yard, but how are you supposed to pull the whole thing up? Well, there’s no need to worry, because we have your back. When you work with a professional tree service like Mr. Tree, you have nothing to worry about. Taking out a stump requires heavy labor and precision, and there’s a lot of room for things to go wrong. With our years of experience and specialized equipment, tearing it out is no problem at all. We’ll safely remove the stump from your landscaping without destroying the surrounding area. Once everything is cleared out, we’re more than happy to work with you to determine how to use the empty space next. Whether you want to add more vegetation, put in a brand-new tree, or have any other projects in mind, our skills are at your disposal.